Deeply rooted in Virginia's history, Draper Valley is truly an oasis for the serious golfer. Designed by Mother Nature, we invite you to join us and see for yourself, why we have been highly rated by both Golf Digest and Golf Magazine in past years. 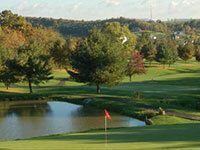 Come see Draper Valley Golf Club, a country club approach to public golf. Rated 4 1/2 Stars by Golf Digest’s ‘Best Places to Play’, #9 on Golfweek’s Best Campus Courses in America and # 5 in Virginia by Golfweek's Best Courses to Play, the golf course provides a test of strategy and skills for golfers of every skill level. Dye’s signature bunkers, small elevated greens and collection points are evident throughout your round. Abundant wildlife and native birds including a pair of soaring bald eagles are frequently spotted and add to the panoramic Blue Ridge Mountain setting.